Looking for homes in St. Mary's Ga? St Marys Ga real estate buy homes | land StMarysGa realestate Search everything the web has to offer for St Marys Ga! We can show all area listings. View homes, land, lots for sale. If we don't have it on the site, tell us we will find it! Need local real estate information? We have summarized much of what is important about the Saint Marys and Kingsland real estate market in this site. View Homes for sale, land for sale! Need expert advice? Our site is filled with ways that you can contact us for one-on-one expert help and advice. That's our job. Contact us with confidence! We guarantee your privacy will be respected. And offer the services on this site for free and without obligation. Why, we want to be your trusted, professional real estate partner. We will help you in your search and getting ready to buy a home with our buyers information tips. Together we can help you sell your home, for as much as the market will bear, and as quickly as possible. The county includes unspoiled Cumberland Island. Largely owned by the U.S. Department of the Interior, the island is accessible only by boat or plane. Nevertheless, Cumberland Island has almost 40,000 visitors annually. St. Marys celebrates the 4th of July and Rock Shrimp Festivals sponsored by the St. Marys Kiwanis Club and the Mardi Gras sponsored by the St. Marys Downtown Merchants Association. Why not let us help you with your real estate needs? Saint Marys and Kingsland, Georgia, real estate, listings, home buying, selling, Realtor, homes for sale, agent, broker, relocating, land, residential, property, house, Camden County, GA, waterfront properties, military relocation Relocate to St Marys Georgia. Buy real estate in St Marys Georgia. With the unique location of St Marys, you can have a custom home built or buy properties on a gated golf course, the ocean or river and in gated communities to live in as your home, condo, a second home manufactured home or an investment property. We offer local information on places of worship and religious facilities, hospitals, public education, and city government information. For your convenience, we have tried to provide information on St Mary's Georgia vacation rentals, hotels, apartments and homes for rent, photos, professional services and custom home builders. St Mary's Georgia is a lovely place to visit and relocate your family to. Enjoy sightseeing, fishing, lodging, golf, Hotels, nearby beautiful beaches, and don't forget the wonderful weather, we look forward to serving you. Planning to relocate to St Marys, Georgia, area view local real estate and homes for sale! These properties cover St Marys, St Mary's, Georgia, Kingsland, Ga. and the Kingsbay Naval Base. If we do not have a property listed that meets your needs, CONTACT US for your "FREE" personalized, custom real estate search! We have attempted to provide a bit of history about St. Marys, Georgia. The categories to the left will assist you in your visit or re-location to this area. Park your car and stroll along Osborne Street, shaded by giant oak and palm trees. White picket fences surround many of the historic landmarks. Flowered walkways invite you to come rock "for a spell" on one of the many sea-breezed verandas. Gift and antique shops housed in turn-of-the-century buildings offer hours of browsing. 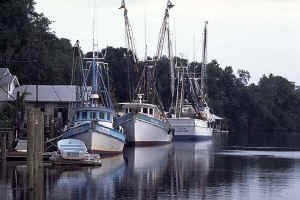 Enjoy delicious fresh seafood and other excellent cuisine found in the eateries of St. Marys. Stay for a while in a historic hotel, or one of the bed and breakfasts, or locally owned family hotels. From most of the accommodations, you can walk to the pedestrian ferry for a 45-minute boat ride to Cumberland Island National Seashore, where wild horses, white sandy beaches, and unspoiled and natural habitat will greet you. Just a few of the many sites you will see in Historic St. Marys include: Orange Hall Welcome Center and House Museum. With its Doric columns on the front veranda and the wide steps leading from the ground up to the second floor main entrance, it is a wonderful example of Greek revival architecture. In 1973, Orange Hall was placed on the National Register of Historic Places. It was refurbished to its original grandeur by caring citizens of St. Marys. It is open Monday through Saturday, 9 a.m. until 5 p.m. and Sunday, 1pm till 5pm. First Presbyterian Church was built in 1808 and is the second oldest church in Georgia. Other 19th century churches in historic St. Marys include Our Lady Star of the Sea Chapel (1847), Christ Episcopal (1880), and St. Marys Methodist Chapel (1858). Oak Grove Cemetery, here you will find much of the history of Camden County recorded under the huge oak trees sheltering this historic cemetery. The earliest marked grave is from 1801. Graves of veterans representing every war, we believe, are found in Oak Grove Cemetery. Toonerville Trolley - "See You In The Funny Papers!" This saying originated by Roy Crane in his 1935 "Wash Tubbs & Easy" comic strip. The strip featured the many local personalities who used this railcar to commute from St. Marys to Kingsland in the late 1920s. A short distance west of St Marys and you will find yourself in a world where boats are the main form of transportation. Okefenokee, an Indian name meaning "Land of the Trembling Earth," is a vast wetland area encompassing around 400,000 acres of canals and moss-draped cypress trees. The Laura S. Walker State Park is available. This is the ONLY park ever named for a person who was still LIVING when so named, Laura Singleton Walker, my great grandmother. Visitors to the refuge can enjoy guided boat tours or paddle their own boats as they encounter the hundreds of species of plant and animal life, including the often photographed alligators, which call the Okefenokee home. Fishing, camping, picnicking, and bike rentals are also available.